You may know this as eggplant parmigiana. It’s a classic Italian dish made with fried sliced “breaded” melanzana, layered with cheese and tomato sauce, then baked. It’s quite labour intensive, it takes over an hour to prepare but I promise that it’s totally worth it. You can take some shortcuts – use already grated mozzarella like we did. This is a one pan meal, you normally wouldn’t eat anything additionally, but if you want to add a steak or some chicken with it to round it out that’s fine! 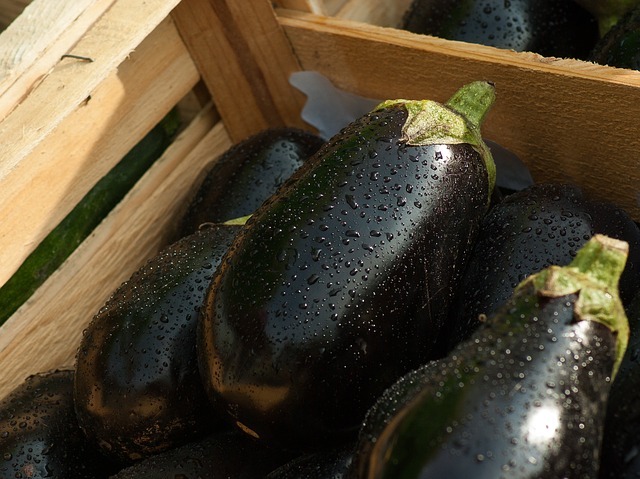 Set the slices inside a large colander and add coarse salt, layer the eggplant slices and the salt. 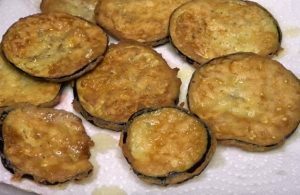 Once all the eggplant slices are in the colander, add a weight on top of them and wait 20 to 30 minutes. Let it come to a boil and then let it simmer for 20 minutes or so. Mind that the batter does not become too thick. Coconut flour tends to have a delayed effect on thickness. If too thick add a bit more water and whisk. Restart with another layer of eggplant, etc. Continue until you complete the last layer, which must be with tomato sauce, mozzarella, parmigiano and basil. Put into the oven for 40 minutes at 180 degrees, or until the cheese on top is melted and crispy. Let it rest for a while (20 minutes or so) before serving it.